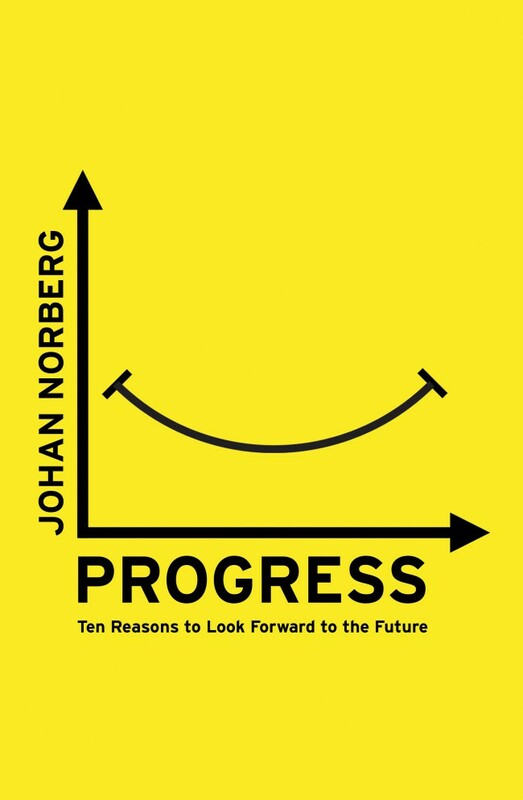 The Swede Johan Norberg has written a book in which he describes how the world has made progress in many areas. The book, titled Progress: Ten Reasons to Look Forward to the Future, has ten chapters in which the following topics are treated: food, sanitation, life expectancy, poverty, violence, the environment, literacy, freedom, equality, and children's rights and perspectives. In his treatment of these topics Norberg uses vivid examples and a lot of objective data. Even if you have read some things about the great progress in the world, you will probably still come across some informative new material in this book. The book is interesting although I have a point of criticism. The central message of the book is that the world has made more progress in the last 100 years than in the 100.000 years before. For different reasons this can be a message which is hard to believe. One of those reasons is that we do not know a lot about how things actually were in the past. Several hundreds of years ago people died in big numbers at a young age from famines, diseases and violence. Another reason is that we remember the past in a distorted way. Both on a macro level and in our personal lives we often fail to see progress because we remember the past as better than it actually was. Yet another reason is that the media do not systematically and frequently inform us about the worldwide progress which has been going on slowly but surely for decades. Instead the media mainly inform us about negative and frightful events which happen on a daily basis. As can be read in the book, solving one problem (making progress) often goes together with the emergence of new problems. The industrialization, for example, which created more wealth for many, at the same time created serious air pollution. Another example is that the Green Revolution which prevented and solved famine on a large scale also lead to environmental problems and health problems, in particular due to the use of pesticides. Norberg has many rational things to say about these types of 'progress problems' (my word). Firstly, he describes how predicted large scale problems often don't actually happen because people manage to solve them before they get a chance to happen. An example of this is that many of the doom predictions by the Club of Rome and by people like Paul Ehrlich have not become a reality. Secondly, he acknowledges certain problems but he argues that the size of these problems is often small when compared to the benefits of the progress. The Green Revolution, for example, creates environmental problems but, at the same time, has made agriculture so efficient that the needed amount of farmland has decreased dramatically. The released farmland can be 'given back' to nature which is a push for biodiversity. Thirdly, he says that real problems, like global warming, have to be solved and most likely will be solved. He argues that what is needed is not only more energy-aware behavior by individuals and organizations but also that technological innovation can contribute greatly to solving the problem. What Norberg writes about these topics is interesting and largely convincing. It is hard for me to asses whether he does justice to different types of environmental problems and threats of which I am not completely reassured. What are the causes of the progress? My impression is that Norberg documents the progress he mentions carefully and convincingly. The next question is: how did humanity accomplish such progress? Which factors contributed to what extent to it? Many of the factors he mentions sound credible. For example, he mentions how the availability of clean water for drinking, washing, and cooking has had a huge impact on the life expectancy of people. Also, he mentions the importance of the discovery of the germ theory of diseases and of penicillin and vaccines as very important. Beside these sorts of things he mentions as important factors behind progress many ideas which emerged in the Age of Enlightenment such as the idea of universal human rights and the belief in progress through the acquisition of knowledge. Also he says that the possibility of individual property, the emerges of trade and of democracies have contributed a lot. What becomes clear throughout the book is that there appears to be a certain sequence in which progress has to happen. Whenever people find themselves in terrible circumstances they are only focused on their narrow interest of survival. In those circumstances, they can hardly be bothered by things like overpopulation, environmental problems and equal rights for certain groups of people. However, as people become more affluent their motivation for these types of things also increases. A special case of what happens as people get wealthier is that they tend to get fewer children. Thus, if you want to fight overpopulation and future famine and environmental problems, there is probably nothing better you can do than to fight poverty. Underestimation of the importance of governments? Although I recommend the book I do have a criticism. I think the author is more convincing in his description of the progress that has been made than in pointing out the factors underlying it. I acknowledge that the second question is harder than the first question. But the question is quite important so it needs to be answered adequately. In particular, I suspect the author gives to much credit to the positive role of capitalism and wealth. The role of governments gets too little credit, I think, and is even sometimes described as negative. After I read the book I noticed that the author is linked to a libertarian organization which may explain the previous point. I am skeptical about the libertarian belief in a minimal government. I think democratic governments play an essential role in many of the types of progress the book describes. For example, governments are needed to define and confine the capitalist system (see Robert Reich's latest book). Without good regulation organizations can do harmful things and become to powerful (see the 2008 crisis and the current undermining of corporations of the American democracy). Also, I think that the importance of governments is underestimated in the development of knowledge and technology. Norberg does emphasize the great importance of knowledge and technology but hardly mentions the critical role which the government plays in its development (see for example here).